Instagram has made good on its promise to start purging inactive, fake and spam accounts this December, and it's doing such a great job that users are calling it "Instagram Rapture" or "Instapurge." Celebrities ended up losing a big chunk of their followers, like Justin Bieber whose Belieber count went down by 3.5 million, according to the list created by software developer Zach Allia. Ariana Grande's numbers are also down by 1.5 million, while Kim Kardashian lost 1.3 million fake minions. Someone named chiragchirag78 even went from boasting 4 million fans to have only eight left -- poor user was so devastated, he ended up deleting his account. But it's still Instagram itself that's suffered the worst blow, shedding almost 19 million followers in the process. 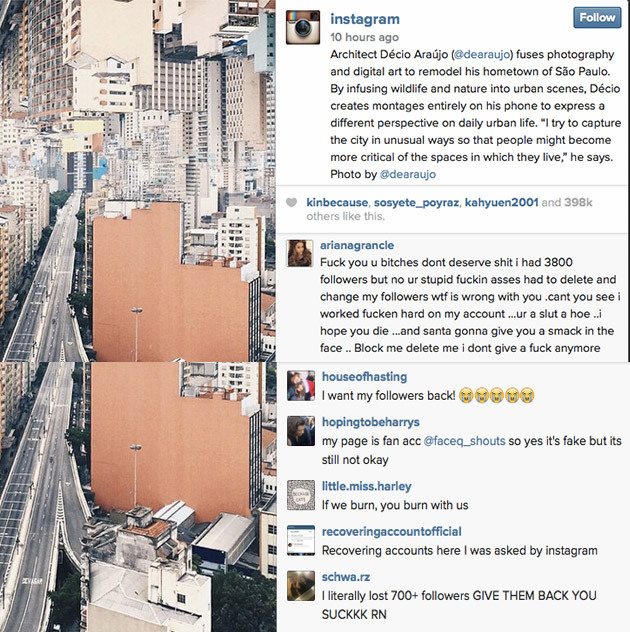 Since Instagram's efforts are sitewide, even ordinary people's follower counts are affected. And while many praised the Facebook-owned service for cracking down on spambots (thereby exposing those who've purchased fake followers), there's an army of slighted users, as well. Some are continuing to post a barrage of insults and profanities on Instagram's official account, while others are campaigning for people to unfollow it. What these angry users might not know, though, is that the service deactivated those fake accounts and spambots long ago, an Instagram spokesperson told Business Insider. The service is merely removing them for good.